`Til Dawn is a tuition-based program, but no student is ever turned away because of inability to pay. Scholarship application available here. Each May `Til Dawn holds auditions for new member and in June `Til Dawn has a full length concert to highlight each of the individual students and celebrate the seniors. In December we hold the SING OUT! an annual performance featuring `Til Dawn alum (Still Dawn) and the current `Til Dawn company. Sign up for our email list to get updated information on all things `Til Dawn. `Til Dawn rehearses twice a week at Youth in Arts and participates in three weekend retreats throughout the year. The group maintains an extensive year-round performance schedule, singing at schools, community events and charitable benefits. In addition there are two annual events that occur -the winter “Sing Out!” which combines the current company along with esteemed alumni and an annual show at the beginning of June. `Til Dawn can perform at your school, office party or private event. Click here for school Assembly information. For private events and parties, email Austin Willacy. `Til Dawn released its first CD in 1995 entitled Get Motivated Baby. The group’s second album in 2000, In Toon, was runner up for Best High School Recording from the Contemporary A Cappella Recording Awards (CARA). Songs in the Key of AWESOME (2004) won two CARA awards, one for Best High School Album and the second for Best High School Solo. The `Til Dawn CD Crescendo was released in December 2009, was nominated for Best High School Album and won Best High School Solo (Haley Keagan for “Til It Happens”). Click to purchase CDs from `Til Dawn on CD Baby. Watch a recent music video created by `Til Dawn Alum Randy Shapiro. 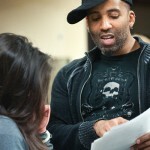 Members of `Til Dawn receive hundreds hours of instruction and mentorship each year from Director Austin Willacy. Austin provides not only vocal training and direction, but also leads `Til Dawn members in discussions and retreats that build the group’s cohesion as well as the critical thinking and interpersonal skills of each member. Austin is a professional singer and songwriter who performs and records both solo and with Tommy Boy/Warner Bros. artists The House Jacks. `Til Dawn members often have opportunities to see Austin perform with the House Jacks or his own band. Most years `Til Dawn will open for the House Jacks in at least one professional performance. Read more about Austin here. Each Spring `Til Dawn hosts competitive auditions. For more information about how to be part of `Til Dawn click here. Aidan sang before he could talk and has never stopped. Over the years he has played piano and sung in community talent shows, school and camp musicals and graduation ceremonies. He was a soloist in the ROCK gospel choir at Drake and also loves to play baseball. Aidan has played and sung music as long as he can remember and hopes to continue through high school and into his adult life. Megan has been singing for as long as she can remember. She loves to sing and play instruments including piano, guitar, and ukulele. She has been working with her voice coach, Amber Morris, for 4 years. She enjoys performing at open mics around Marin. Megan is in Performance Workshop in the music program at Redwood High School. Outside of music, she loves playing soccer and basketball. She is extremely excited to be a member of ‘Til Dawn! Lara has been singing for as long as she can remember. She loves to sing, dance, act, and perform on stage. Before doing musicals with Performing Arts Academy of Marin, she was a part of the Marin Girls Chorus. Lara has always wanted to be in an a cappella group, and is so excited to be in `Til Dawn. Sheyla attends Novato High School and absolutely loves the program. She has learned so much, and is still wanting to learn more about music. Sheyla has been very passionate about singing ever since she was a little girl but never really took it seriously until she was in 7th grade. She auditioned to be on the voice kids, and unfortunately she didn’t make it but that didn’t stop her from doing what she loves. Ever since she heard about `Til Dawn she’s been trying to everything possible to grow as a singer to get to her dreams. Maycie has been involved with music for over 8 years, and finds way to incorporate it into her life as much as possible. She sees it as a way to express herself and also to connect with others. Since living in California, she’s participated in every singing program her school has to offer, including annually acting in musicals since she started attending San Domenico. She loves the social side of singing and plans to keep music in her life forever. Angel has been singing since she could talk and loves poetry and performance. She believes art is a part of everyday life and an important part of a healthy mindset and lifestyle. She is now studying at MSA in advanced treble choir, rock band and music theory. Kathryn has been singing for over 12 years, and taking private voice lessons with Krista Wigle for 4 years. She loves performing, whether it is as part of an ensemble, as a solo singer, or as an actress. She is a member of Marin Academy’s music and theater programs. Kathryn also loves musical theater and has performed as part of the Cabaret Ensemble, the musical Homefront, and many summer classes at the American Conservatory Theater. Singing is her passion, and she loves being able to share music with other people through `Til Dawn. Kathryn is also a Board Member of Youth in Arts. Paul has been singing under the direction of Susie Martone from fifth grade through eighth grade and would love to keep it going into High School. He has made new friends through singing and feels that it would be great to keep singing in his life. Anna McShea is honored to be a member of `Til Dawn. She has been singing most of her life, and has appeared onstage many times around Marin County. She performs in the San Geronimo Valley’s Family Music Hour, at the Fairfax Festival and local restaurants. She also appears at other venues as a soloist, lead, and a background singer. Franco has been singing for 2 years along with 4 years of symphonic band and 2 year sof jazz band. Franco loves the community feel of music as a whole and loves to be in musical ensembles. He plans to continue with his musical career through high school and into college with singing and jazz. He plans to make every year better then the last with school and music. Will Noyce is the lead singer of Jojo on the Moon, a indie rock band he started with his friends. Along with singing, he plays guitar and produces music. Will is also an avid filmmaker, directing multiple award winning shorts that have screened across the country including the local Mill Valley Film Festival. 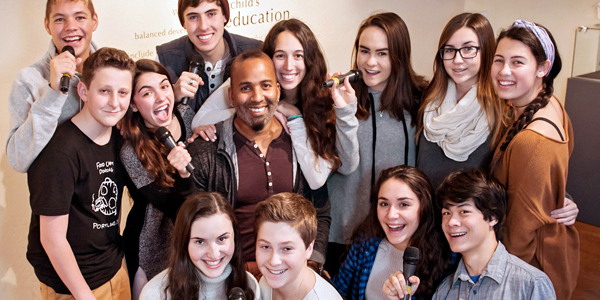 He loves sharing his passion for art by singing and spreading positive energy in the world. Megan has been involved with music for 5 years, transitioning from band to choir. She loves learning new things and involving herself in the social side of music. She enjoys listening to all types of music, but mostly likes singing jazz and rock. Most of her experience with singing has been solely dependent on teachers and peers, but she is excited to take a more solo approach. Ian has been singing for 10 years. He loves singing in groups and harmonizing. He sang in a quartet for a play and has been a soloist in White Hill’s chorus. He’s excited to be a part of `Til Dawn’s bass section. Maud is 17 years old and attends Tamalpais High School. She has been studying voice for the last six years, but has been singing since she could talk. Additionally, Maud also plays piano, guitar, and drums. Maud has always wanted to be part of an a cappella group, and being part of `Til Dawn is a dream come true. Zaria loves to sing and has been singing since she started in a choir at seven years old. She loves to write and sing and enjoys making new friends. She is excited to be part of something as amazing as`Til Dawn. Isadora Zucker, a student at Sir Francis Drake High School, is a multifaceted performer active in music, theater, and dance, all of which she’s been studying since early childhood. Outside of the arts, Izzy enjoys acting, swimming, her cat Hollywood, and spending summers traveling with her musical family, better known as the Zucker Family Band.